Shoulder injuries come hard and fast in this age. Causes of such injuries aside, once your doctor has sent you off to get a scan in order to diagnose the injury, an understanding of what your results are saying can help paint a picture of what’s going on beneath the skin that’s resulting in your immense pain and discomfort. Although not everyone cares about what’s happening on the inside, I have found that patients are more motivated to stick with rehabilitation if they understand the mechanisms of the injury. For shoulder injuries, your doctor might suggest an ultrasound, MRI and/or Xray for diagnosis of your injury. Ultrasound is likely the most common scan for diagnosis of shoulder injuries as it is non invasive and affordable relative to an MRI. An ultrasound utilises high frequency sound waves to give an image of structures beneath the skin. An ultrasound primarily focuses on the soft tissue and is fairly accurate at reporting tendon & bursa damage. Ultrasound is not usually effective in identifying injuries to the bones. Usually the scan will be undertaken by a technician and then the images reported on by the specialist who will file the report. It usually will be over in 10 minutes. Magnetic Resonance Imaging (MRI) is a very detailed and accurate imagining option that some doctors and specialists will choose for diagnosis. Usually, MRI is substantially more expensive than ultrasound but does correspond to a more detailed view of the injury. MRI is usually undertaken as a first point of call for athletes, workplace injuries or those in high socio-economic classes. Occasionally, doctors will start with an ultrasound but if there is doubt over the results when paired with the symptoms then an MRI may be suggested in addition to other scans. X-ray is a form of electromagnetic radiation that gives an image of solid structures within the body. For shoulder injuries, X-ray is primarily used if there is concern of the health of bony structures in and around the joint. X-ray is not always included in diagnosis of a shoulder injury but may be suggested if the injury pathway involved a fall or sudden trauma as bone health can be compromised. There are many possible injuries that a scan can identify as a result of a shoulder injury, each issue can have different severities which can result in differing treatment approaches. The rotator cuff muscles are a group of 4 muscles that stabilise and support the shoulder joint. They work to secure the humerus against the acromion during dynamic movements. Supraspinatus – The most commonly injured rotator cuff muscle. Often injured during loaded abduction and overhead lifting. Primarily responsible for abducting the arm above shoulder height. Infraspinatus – Primarily responsible for external rotation of the humerus. Teres Minor – Externally rotates the humerus. Subscapularis – Internally rotates the humerus. Deltoid Muscle – Large muscle that spans from the scapula and clavicle to the humerus. Its primarily responsible for abduction, transverse flexion and extension. Pectoral Muscle – muscles of the chest, two levels known as pectoralis major and pectoralis minor. Primarily responsible for shoulder flexion and adduction. Latissimus Dorsi – A large, broad muscle of the back. Primarily responsible for arm adduction and extension. Trapezius Muscle – Large muscle primarily responsible for scapula elevation, retraction and depression. Has upper, middle and lower components. 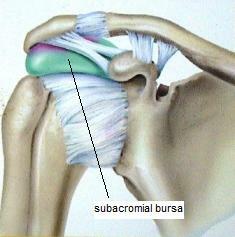 Subacromial Bursae – The bursa is a sac of fluid that prevents bone-to-bone friction. 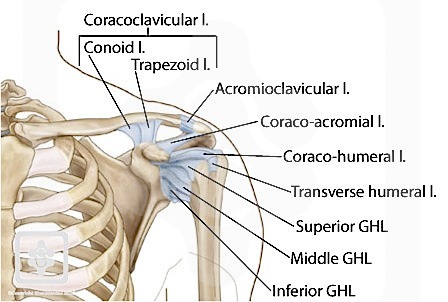 The subacromial bursa serves as a buffer between the humerus and acromion process of the scapula. It is commonly inflamed as a result of injury resulting in reduced range of motion and pain. “Partial Thickness Tear” – Often of a tendon, this indicates that the tendon is not completely torn through all the fibres of the tendon. “Full Thickness Tear” – Also of a tendon, indicates that the tear has spanned the full depth of the tendon. “Tendonitis” – Indicates inflammation of a tendon. This can result in increased pain and decreased range of motion as the tendon is taking up more space in the joint. Inflammation is an acute response to injury whereby the body increases blood flow to a site in order to aid recovery. “Bursitis” – Indicates inflammation or swelling of the bursae. As with tendonitis, increased pain and decreased range of motion can occur as a result of the bursae taking up more room than the space permits.